Work long hours throughout the week leaves us without a lot of spare time for family, friends and social gathering. Many people begin to feel disconnected. Yoga classes are a wonderful way for people to socialize and be amongst other like-minded people, creating a sense of community. In a yoga class, people feel connected to one another, as they tap into the energy of the whole group. 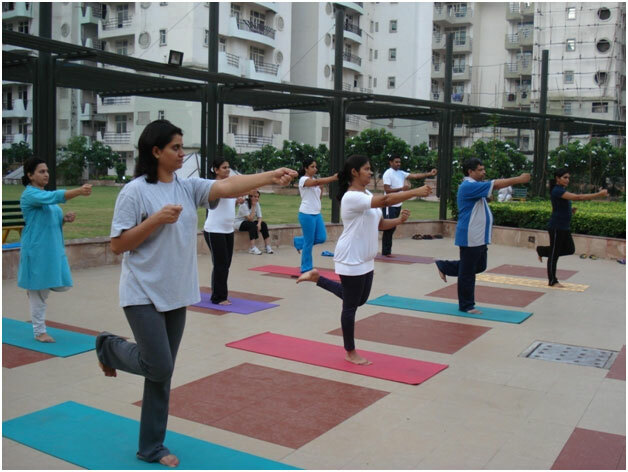 Doing Yoga in group can be ECONOMICAL, MOTIVATIONAL & ENCOURAGING as people get motivated and perform better in a group. Benefits for conducting Yoga at society premises are - Affordable prices, health at doorsteps and flexible timings to suit everybody (all age groups) whether working or non-working. The space to conduct Yoga classes can be arranged in the society community centre. Please let us know your requirements & we will design a customized program that suits your need. Charges will depend no. of participants and timings of class.